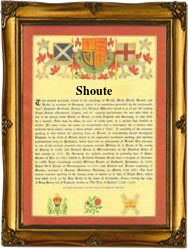 This interesting and unusual name recorded in church registers of Wiltshire and Devonshire from the mid 16th Century under the variant spellings Showt(e), Shute, Shoutt and Shoute, is of locational origin from any of the places in these counties named with the Old English pre 7th Century 'sciete', a variant of 'sceat' meaning 'projection', for example, Shute in Devonshire, recorded as Schieta circa 1200, and Sheat in Wiltshire appearing as La Schete in the 1287 Fine Court Rolls of that county. On January 29th 1548 one, William Shute appears in the Marriage Register of Shobrooke, Devon, infant, was christened in Kenn, Devon. The variant spellings Showte and Shoute were recorded in Exminster and Parkham in 1572 and 1574 respectively. On April 7th 1589 Christpiane Shute and Martine Wymple were married in Trowbridge, Wiltshire, and on February 17th 1655 Walter Shout was christened in St. Mary's, Tedburn, Devonshire. The first recorded spelling of the family name is shown to be that of Elizabeth Showt, (christening), which was dated February 6th 1540, at Trowbridge, Wiltshire, during the reign of King Henry V111, known as 'Bluff King Hal', 1509 - 1547. Surnames became necessary when governments introduced personal taxation. In England this was known as Poll Tax. Throughout the centuries, surnames in every country have continued to "develop" often leading to astonishing variants of the original spelling.